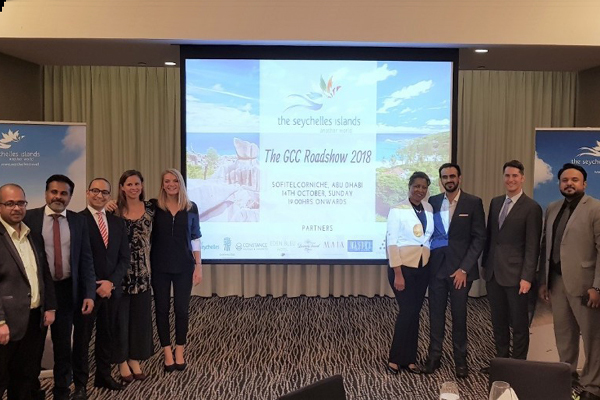 The Seychelles Tourism Board (STB) Office in Dubai conducted the third edition of its GCC roadshow across Abu Dhabi, Dubai, Kuwait, and Qatar from October 14 to 17. STB’s delegation was led by the manager of STB Office in Dubai, Ahmed Fathallah, and STB Headquarters’ senior marketing executive, Natacha Servina. They were joined by representatives of several local partners, including Air Seychelles, Banyan Tree Seychelles, Constance Hotels & Resorts, Eden Bleu Hotel, Luxury Travel and Maia Luxury Resort and Spa, among others. Hosted in centrally located venues in each city, the agents were also hosted to a dinner which allowed more time for them to network with the STB representatives and local partners. The evenings ended with a raffle draw with prizes, where winner/s won a trip to Seychelles with accommodation and excursions offered by the partners. The GCC Roadshow has become an annual staple to the STB Office in Dubai as it is a perfect venue to strengthen the relationship among the trade partners in the region as well as pave the way for future profitable collaborations of the partners with the local hotels, destination management companies (DMCs), and airline from Seychelles.